The most common leaks found in an engine are intake manifold gasket leaks. Intake manifold gaskets can be made of paper, rubber, metal, and sometimes a combination of the three. 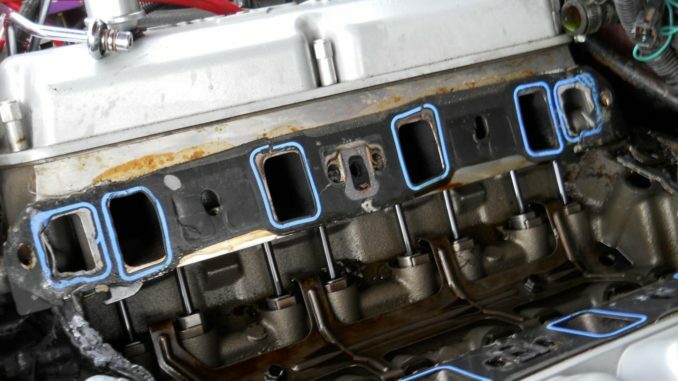 Intake manifold gaskets are responsible for sealing the intake manifold against the cylinder head(s). Apart from sealing engine vacuum, certain intake manifold designs will also seal engine coolant. When the intake manifold gaskets have an issue, they can cause drivability problems and even engine overheating. Usually a faulty intake manifold gasket will produce a few symptoms that can alert the driver of a potential issue. 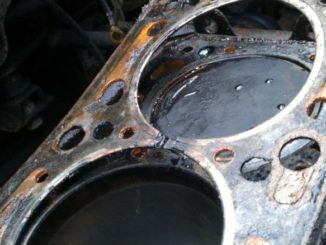 If this gasket starts leaking, it would spell trouble for your engine. That is why you need to learn about what the symptoms are of a leaky intake manifold gasket. Once you recognize this, you can proceed to fix the problem without wasting any more time. On engines with aluminum cylinder heads, corrosion typically erodes the area around the coolant ports. So, If the sealing bead is eaten away the gasket will leak. 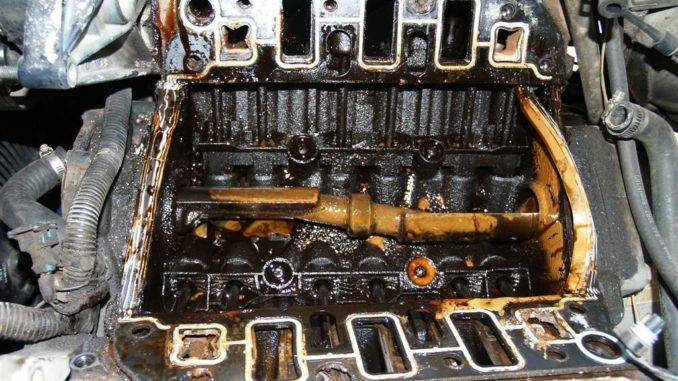 In this case, you can’t blame the leak on the gasket. Some manufacturers redesigned the intake manifold service gaskets for some of their problem applications. As a result, They’ve changed the sealing beads from silicone rubber to a tougher material called fluoroelastomer (FKM) rubber. This is much more resistant to oils, solvents and chemical attack. 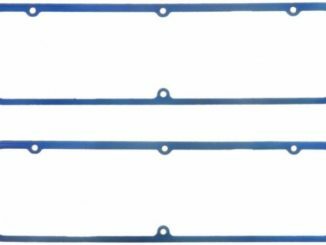 The location of the sealing beads on some gaskets has also been revised. The original OE gaskets as well as the revised service gaskets are usually black with orange sealing beads. Let’s start with vacuum leaks. May cause one or more of these symptoms as well. A fuel trim problem can occur if the intake manifold has the tiniest leak. If you just use your eyes and ears to find the leak, it will become very time-consuming. So, Anytime air leaks through the intake manifold, it will cause air to get sucked in. Whatever is in the air that’s pulled in will compromise the mixture of the fuel and air. As a result, this will impact the emission and the engine systems. If you have a smoke machine, then multiple leaks can be diagnosed in a shorter amount of time. This machine does this by allowing the intake manifold to become pressurized while placing vapor and smoke into the system. So, if a leak truly does exist, then smoke will be drawn out. Find a vacuum port and attach the smoke machine to it. Ensure that you have the right sized plug when blocking the throttle body. The PCV system must be blocked off as well. 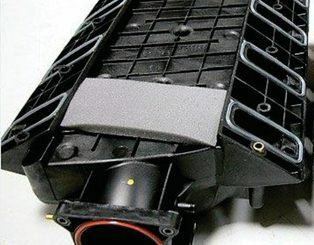 If the PCV system or oil filter has smoke coming out of it and the engine is not misfiring, then it probably means there is a crack or leak underneath the intake manifold. Most of the time this will also cause high oil consumption. Seal off all openings remove the PCV valve and plug it. Remove the dipstick and attach a vacuum gauge to the dipstick tube. Start the engine. Pulling one to three inches of vacuum is normal. Pulling anything from eight to eighteen confirms an internal vacuum leak. This may produce a distinct coolant smell, along with steam, and drips or puddles of coolant underneath the vehicle. A coolant leak will eventually lead to engine overheating when the coolant level drops too low. Also, there are instances where overheating can occur without any visible leaks. If damage were to come to the seal, all the pressurized coolant it is holding back may seep through it. Often times, the coolant will have debris and dirt inside of it which will create even more problems. If the debris is thick enough, it will cause more wear on the surfaces. Not only that, leaky coolant will also cause air from the outside to get into the engine through the seal. Anytime oxygen is present, it will drastically increase the amount of corrosion that forms. This will cause even more damage to the surface. Consequently, If there were to be a change in the level of air or fuel in this mixture, it would have a negative impact on the performance of the engine. 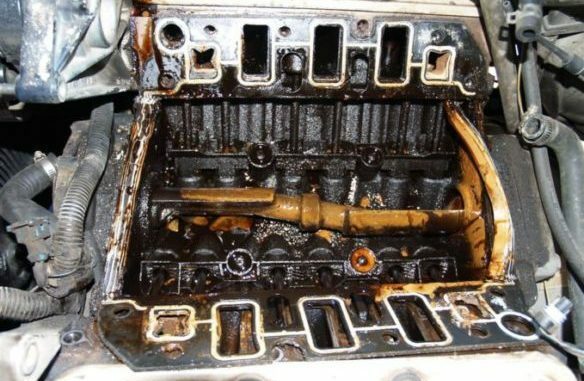 Therefore, if you were to have leaky coolant from a damaged intake manifold gasket, then more air may get into the intake manifold and cause an imbalanced mixture. Once that happens, the symptoms will typically be rough idling and numerous backfires. If coolant leaks on the outside of the gasket, then you can see it. If there are internal leaks going into the oil or combustion chamber,you won’t be able to spot them. What you’ll want to do is give your system a complete inspection. 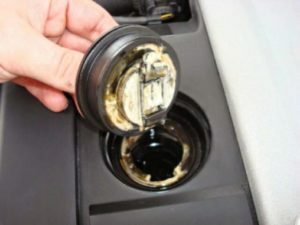 Start by checking the oil for signs of foaming or other types of contamination. You should also pull the codes so you know exactly what you’re dealing with. If the codes relate to the oxygen sensor, then you may have coolant in the combustion chamber. Coolant will cause damage to the catalytic converter and the oxygen sensor. If you have a V8 or V6 engine, use the codes to figure out which bank has the leak. Any big leaks that are in the runner may give you a misfire code. If you experience this problem for extended periods of time, take out all the spark plugs in your vehicle. See if the electrodes have any chalky white deposits on them as this is sign of a coolant leak. Conclusion, By following these techniques, it will help you determine where the leak is coming from.